1. NARS Aqua Gel Luminous Mask – I am all over the NARS makeup, but this was actually my first foray into the skincare. And I was thoroughly impressed. The name is spot on with how the product both looks in texture and the results you get after using. A hybrid between a gel and cream, this mask is like an intense drink of water for my skin. Suitable for any season because being hydrated is necessary 24/7/365, right? Right. 2. Dermalogica MultiVitamin Power Recovery Masque (c/o) – Again as with the previous mask, this product is aptly named, though I think they left out a word – “MAGIC”. This mask is AH-MAY-ZING. Full disclosure: I had this product sitting in my medicine cabinet hidden behind some other products (it’s possible, my cabinet is stuffed. Evidence here), and had overlooked it for months. Then one day, I finished the product in front of it and came face to face again, and I decided to give it a whirl, and have not looked back since. Packed with a multitude of vitamins A,C, E and F, this gave me as close to perfect skin as possible after use. My skin was smooth, hydrated, even toned and felt better than it had in a long time. I now call it my ‘secret weapon’ mask and use it when I need a quick fix. And it delivers every time. 3. 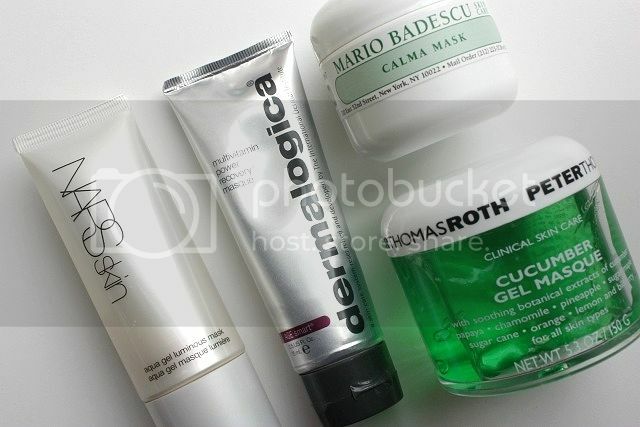 Mario Badescu Calma Mask – I feel peaceful just saying it’s name – Calma Mask. And that is just what it does – calms my skin the heck down. I find that especially when my skin is acting out hormonally and I am desperately trying to treat it with numerous acne products, I pull this out to help give my skin a much needed break. I often use it to balance my skin AFTER I have used an acne/drying mask, and find my breakouts clear up much faster. A blemish free Maree is a happier Maree. 4. Peter Thomas Roth Cucumber Gel Mask – This mask was my summer time BFF after being out in the sun or needed a momentary cool down to a long day in the heat. I would pop it in the refrigerator for a few minutes before and then slather on as necessary. Instantly refreshing and soothing, it’s like a spa in a jar. Now that the weather temps have dropped (I miss you, summer), I find that this is still so helpful to my skin a few times a week, and depending on the week, sometimes daily. Soothe, refresh, repeat. Very nice is the antioxidant mask by Kahina, also clearing, but hydrating. My winter time favs (i am not very in love with them, but their good): Masque Givre by Sisley and Sensai 10 minutes. For the summer i used to like the bubbling mask by Peter Thomas Rooth (i think i saw it somewehere on your blog also), but i got over it.